After a 2nd and 3rd Chicago winter these past few months, the skies opened up and the sun came out for Kara + Kevin’s Langham wedding! Kara loves everything about the Langham Hotel (one of the best in the country!!! ), so we made sure to get a bunch of photos all around their venue! Be sure to scroll down to see photos in front of the Langham marquee at night! If you haven’t already seen their engagement pictures, be sure to check them out here: Kara + Kevin’s Chicago Engagement Photos! Everything went smoothly the whole day. Shout out to Alicia and Julissa from Clementine Events and to Davina from The Langham for planning and coordinating a flawless day! Love the symmetry and embrace in this first photo with the Langham marquee! 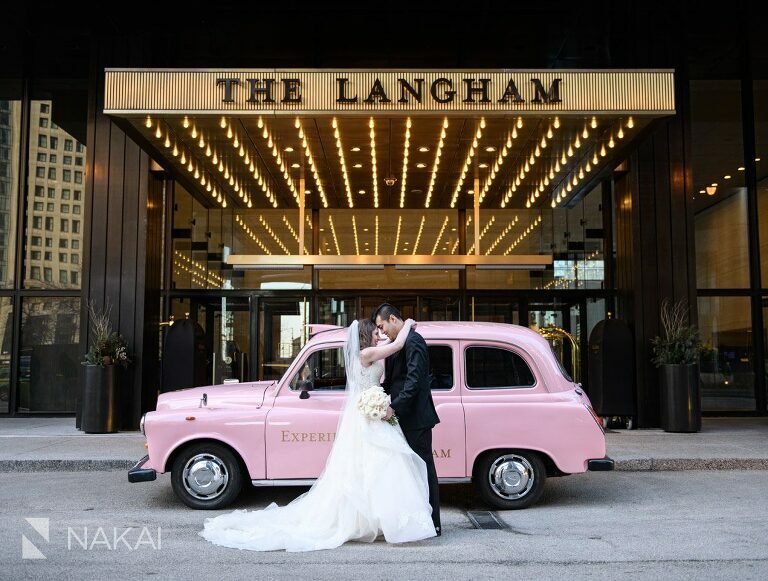 The pink taxi and sign are iconic to this Chicago luxury wedding venue! 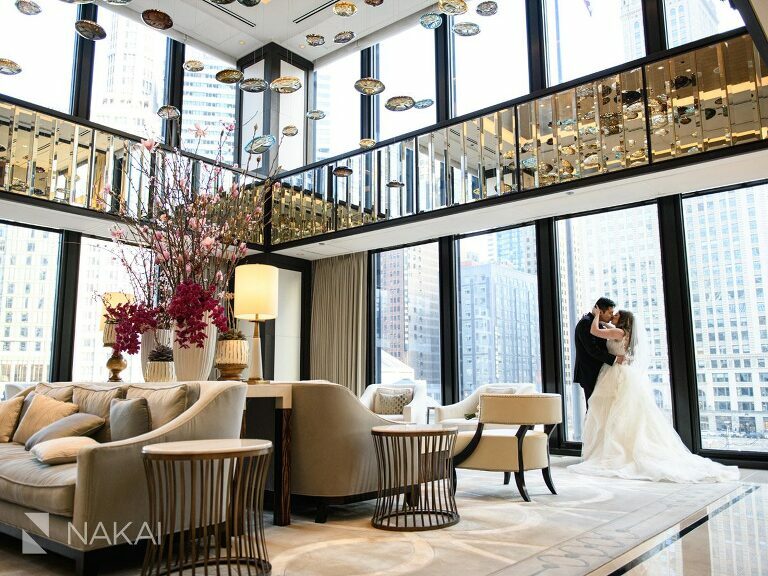 When you pair a beautiful couple and beautiful Langham lobby together, you get an amazing photo! I love incorporating Chicago architecture into wedding day photos. Here the Wrigley Building is in the background! It helps remind the newlyweds where they were married! 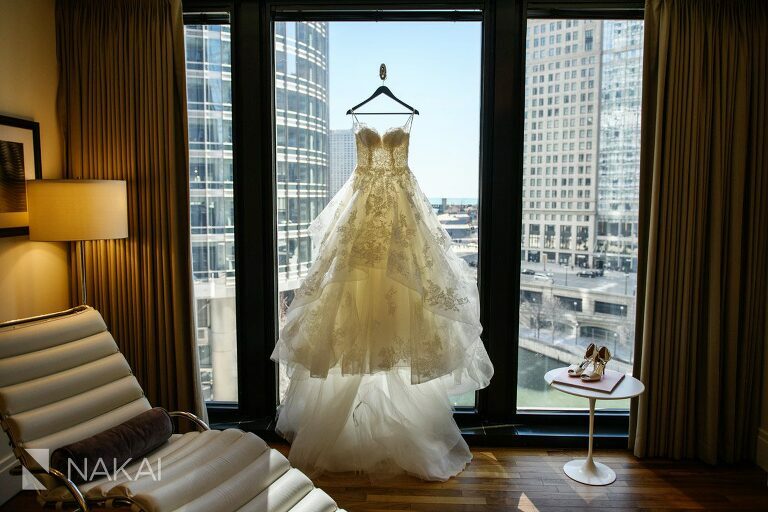 The Langham is located right along the Chicago River, all their bridal getting ready suites boast a view of the River! 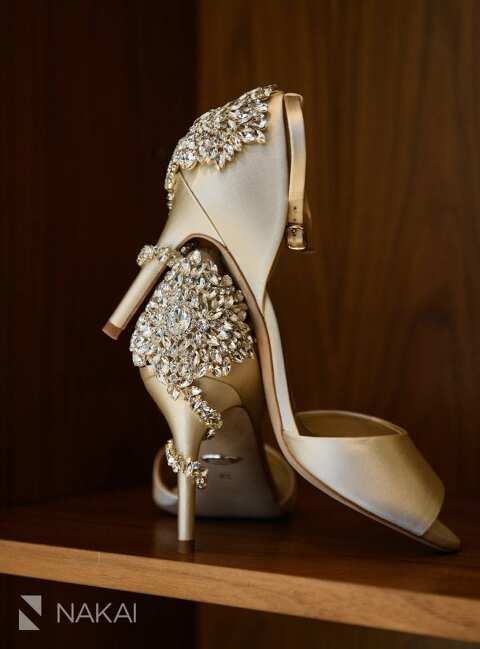 Check out the luxury details on these shoes! Had to take a portrait of the bride in the Langham Lobby! Photographer’s Tip: Framing and symmetry: Here Kara is in the middle with wonderful symmetry and her body is framed by the doorway in the background as well as the floor tiles on the ground! Before the ceremony started, I saw this ray of light where the guys were waiting, so we took a quick picture with all the groomsmen! The moment when Kara + Kevin saw each other for the first time on their wedding day! 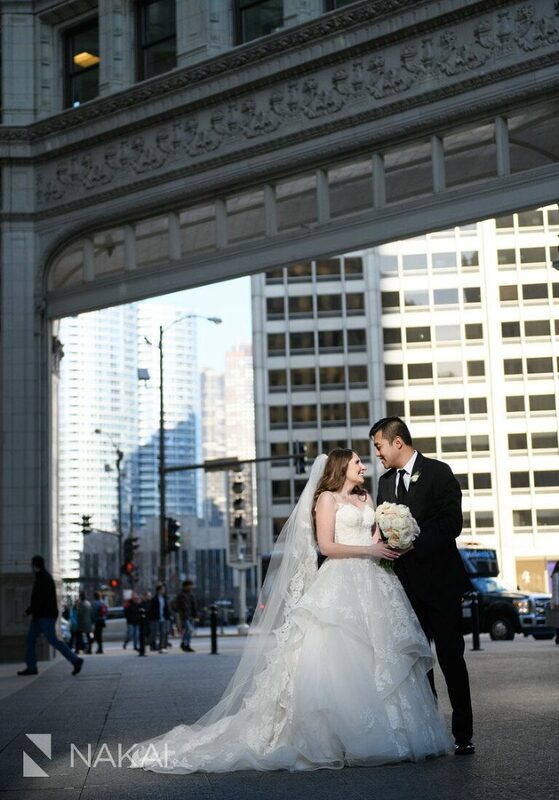 After the ceremony we stopped by one of the best locations for wedding photos, The Wrigley Building! We headed to the Riverwalk for some more pictures! Photographer’s Tip: Take a moment and look from a different vantage point! This photo below and the one above are taken in the exact same spot, except for my position! Two uniquely different pictures in the same spot! We returned to the Langham for their reception and captured a few more photos of the bridal party! Love this ‘Vanity Fair’ style group photo! It’s all about the posing and groupings to make make it look amazing! Love the way the long tables looked in this room shot! Before I departed for the night, we headed down to take a few photos at night! Thank you Kara + Kevin for having me as your wedding photographer! The day was amazing and we captured so many special moments throughout! Can’t wait to share more in the coming weeks!